What's Your Favorite AWD Car? Traction was an issue for many commuters this morning as large chunks of the country are still recovering from storms that brought rain, snow and even a few tornadoes. It's during these times that having an AWD car, while not always necessary, can be sort of fun. And whether it's a bruiser like the Subaru WRX STI or a cruiser like the W12 VW Phaeton, there's nothing like the feeling of leaving heavy RWD trucks to spin off into icy ditches. Unfortunately, two of our favorite AWD cars are not available in the US. 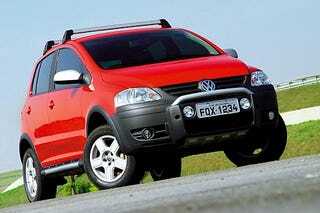 We think that both the Volkswagen Crossfox (pictured above) and the Fiat Panda would be great additions to the American market. Anyone? Anyone? But you tell us, what's your favorite AWD car? And just to get it out of the way, we include all AWD/4x4/symmetrical/asymmetrical/two-engined Hyundais... whatever. It's gotta be a car and it's gotta put power down through all four wheels.